It took four long years for Johnny Stanton to finally make his first start in FBS college football. But the highly decorated former Elite 11 quarterback from Santa Margarita (Calif.) High School didn’t waste much time making his presence felt on Thursday night. 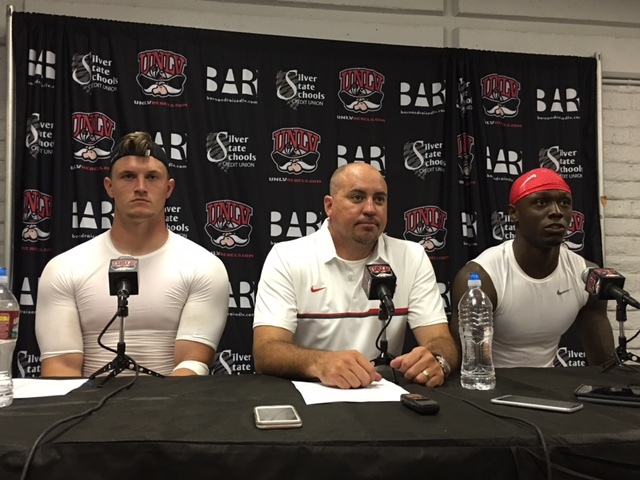 The 6-foot-2, 245-pound Stanton had two touchdowns passes in the first two minutes as UNLV bolted to a 28-7 first quarter lead and then cruised to a 63-13 victory over Jackson State before a crowd of 18,575 at Sam Boyd Stadium. Stanton, who played sparingly in two years at Nebraska before returning to southern California where he earned state JC Offensive Player of the Year honors at Saddleback College in Mission Viejo, completed 10-of-12 passes for 217 yards, three touchdowns and no interceptions in three quarters of action as UNLV (1-0) won its season opener for the first time since 2009. Stanton had touchdowns passes of 56, 32 and 30 yards, all to junior wide receiver Devonte Boyd. Stanton wasn’t the only Rebel having fun this night. Boyd, a preseason first team all-Mountain West pick, weaved his way through the Jackson State defense for four catches for 135 yards and three touchdowns in just a half of action. Sophomore running back Lexington Thomas had 68 yards on 11 carries, including first quarter touchdown runs of 17 and 3 yards, while true freshman Charles Williams rushed for a game-high 96 yards on 12 carries and a touchdown. 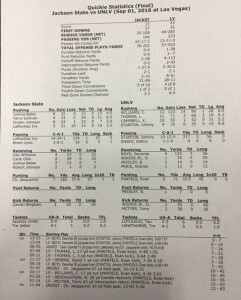 The defense also got into the act, scoring UNLV’s final two touchdowns. Redshirt freshman defensive tackle Nick Dehdashtian scooped up a fumble and rambled 28 yards for one score while senior corner Torry McTyer returned an interception 43 yards for a touchdown just 75 seconds later. Safety Troy Hawthorne also had an interception on Jackson State’s first offensive play of the game that set the stage for Boyd’s second touchdown grab. The 63 points tied for the fourth-most in school history and the 50-point margin of victory was the sixth-largest ever for the Rebels who finished with 503 yards in total offense, including 280 yards rushing. 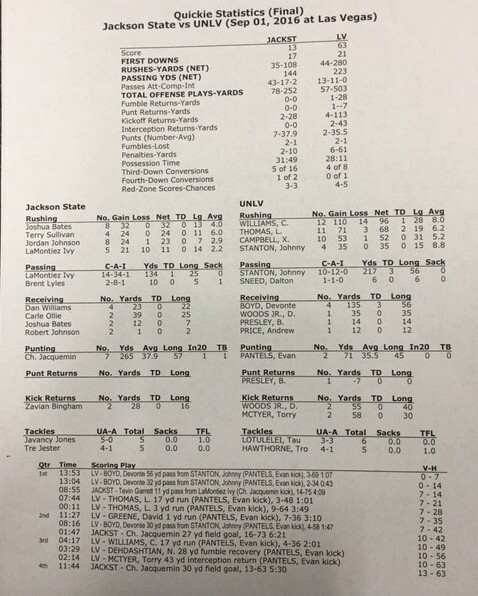 UNLV’s defense held the Tigers to just 252 yards while also forcing three turnovers. But the stat that mattered most to head coach Tony Sanchez was that UNLV is 1-0 headed into next week’s game against UCLA at the Rose Bowl.